The Nintendo 3DS is an eighth-generation handheld game console by Nintendo, released on March 27, 2011 for $249 ($280.84 in 2018 money). It had a Dual-Core ARM11 MPCore at 268 MHz and a single-core ARM9. It had 128MB of RAM and 6MB of VRAM. It has a DMP PICA200 GPU. The most notable feature of this console is the use of autostereoscopic (i.e. without glasses) 3D, which can be configured using a slider. 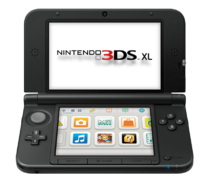 An early in development open-source Nintendo 3DS emulator made by experienced emulator developers. It is considered experimental, and it runs homebrew applications with a decent degree of compatibility. Though it can play most commercial games to some extent, the emulator has various graphical and sound issues with some games, and requires a very powerful CPU for most games to be playable. Citra is being regularly worked on, and progress in it is faster than expected for most emulators. However, there's still no telling how long it will be before it is suitable for playing games to completion. Another open-source Nintendo 3DS emulator, made by experienced developers in the DS hacking scene. It was released shortly after Citra and received similar progress for a few months, but was eventually aborted by its authors after a while. A closed-source Nintendo 3DS emulator, presumably made by the iDeaS author. Little is known about it other than that it can run simple homebrew. It cannot be used for playing games. The Nintendo 3DS currently has no emulators that play all games with all features intact. This is mainly because for a long time the hardware was documented only sparingly, and homebrew code execution was hard to achieve. Nowadays, the hardware is better known and homebrew is being developed. Many games boot now, with a few even having no noticeable graphical issues. However, sound has not fully been implemented. This, along with other various issues, exist that make 3DS emulation not ready for prime time just yet. Includes .CCI (Citra Cart Image), aka .3DS - data on physical carts, can be executed right off the bat, not used much since no one bothered to develop a CFW solution to load them yet (besides converting them to CIA) and only overpriced flashcarts (Gateway/Sky3DS) can load them. Includes .CIA (Citra Importable Archive) and .CXI - installers that unpack game data to the SD card or the 3DS NAND memory. Some homebrew apps (FBI, DevMenu) can install CIA files on 3DS systems with CFW installed. Digital games are often distributed as CIAs. Note that Citrus, Citra, or CTR are the internal code names for the 3DS. Due to one format being so far restricted to overpriced flashcarts and the very slow Citra development (meaning playing on a real 3DS is still the preferred way to go), the CIA format is preferred in many sharing websites, downloader tools and even tools to dump your own games. However, converting a CIA image to 3DS format (and vice-versa) is still possible with no loss of content. Read the Encryption section below for a guide. Some outdated dumping utilities intended for use with Citra (like braindump) produce damaged decrypted 3DS images that can't be easily converted back. No known solution exists so far to fix those dumps. Most dumps online are also encrypted. This encryption poses no problem for playing game images on a real 3DS since it can deal with that encryption with internal keys included in the bootrom, but becomes a problem when trying to emulate them on PC. Citra cannot play encrypted games, only decrypted games will work. A solution to load encrypted images is for the moment on the back burner and there's not much developer interest for it. If you want to play games on Citra, you'll have to convert your game images to that format. Formerly, decrypting those ROMs used to require real 3DS hardware (bafflingly enough, Citra devs still ask users to do this even nowadays). It required files generated by a real 3DS called xorpads unique to that game version, using the encryption engine within the 3DS. After this part, these xorpads (which are big) can be used with PC tools (or other 3DS-based homebrew) to produce the decrypted game image. After that, some 3DS homebrew (Decrypt9, GodMode9) included tools to directly convert encrypted images to decrypted images with a single button press, but those still require a real 3DS. The game changer was the sighax exploit, allowing to dump the 3DS bootrom which includes these encryption keys. This file can be downloaded from the Emulator Files page. You can then use a program like fuse-3ds to decrypt games using this file. Simply place boot9.bin in the same folder, run the program, mount the encrypted .cia or .3ds, and find the decrypted.cxi file inside (usually in the first folder). Citra should be able to load this file without issues.